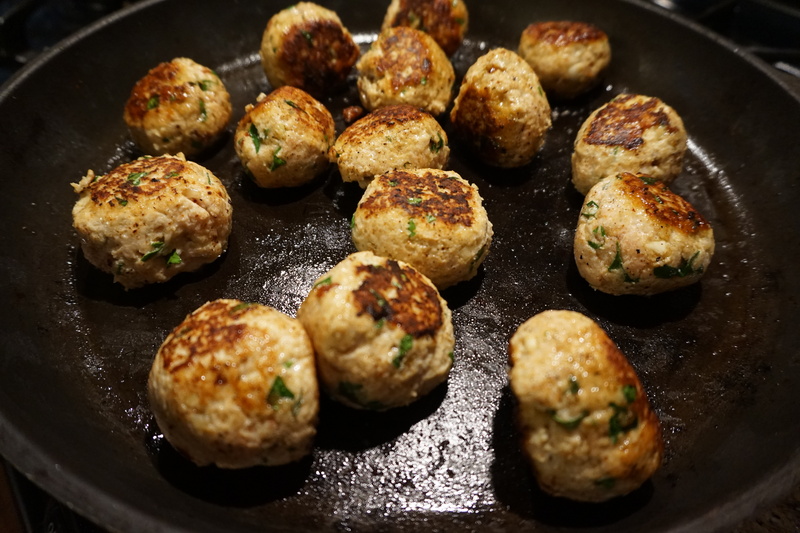 This recipe for chicken meatballs came out of a desire to cut back on my husband’s red meat consumption (which came out of a desire to have him around for a long, long time!). I tried several versions and most came out way too dry and flavorless. The reason why we all love the original is that the meat in meatballs has flavor and fat, both of which are lacking in ground chicken, especially if you go with ground chicken breasts. Undeterred I decided to of course turn to one of my favorite ingredients, cheese. A little bit of ricotta in the mix added moistness and flavor and wasn’t so much as to render them unhealthy. Also pumping up the garlic and adding sun-dried tomatoes ensured that these were not boring meatballs. I served them over pasta but they would be delicious with a mixed green salad if you want to keep it really light. Freeze them in the sauce and they will last quite a bit in the freezer, ready to pull out whenever. We have some in the freezer right now that I think would be smashing in a meatball sub! In a large bowl mix the ricotta, egg, sun dried tomatoes, parsley, bread crumbs, garlic and red pepper flakes. Mix until totally combined (with your hands is easiest) then add in the chicken and mix in just until combined. Adding the chicken last helps you from over mixing the meat which can make for a tough meatball. Season with salt and pepper. Line a cookie sheet with wax or parchment paper (not necessary but means less clean up). 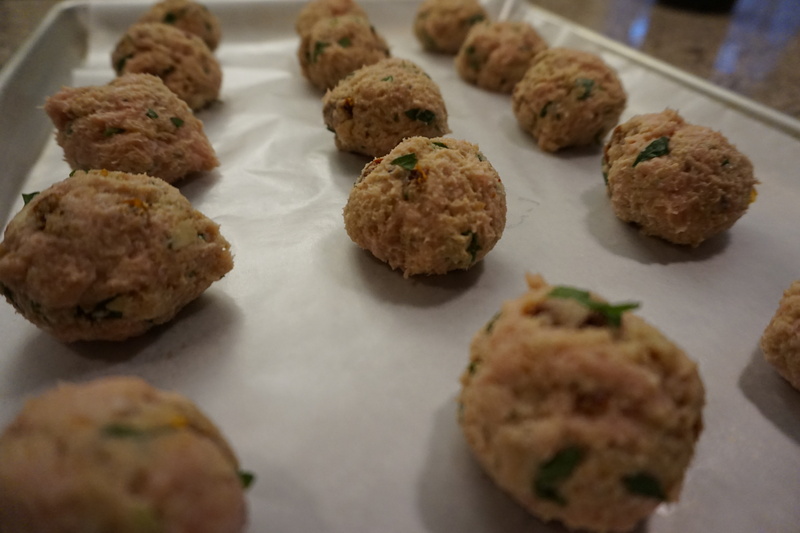 Roll the chicken mixture into golf ball size balls – I like to roll them all out first and then cook them rather than adding them to the pan as you make them so they all cook at the same time. Once you have all of your meatballs formed heat a large skillet over medium high heat. Add 2 tablespoons of olive oil or just enough to coat the bottom of the pan. One the oil is hot carefully add the meatballs, taking care not to splatter yourself with hot oil. Cook the meatballs for about 5 to 7 minutes, shaking the pan occasionally so the meatballs roll around and you get all the sides nice and brown. Turn the heat down a bit and add in the tomato sauce. Carefully (as to not break up the meatballs) use a spoon to stir the meatballs and sauce together to they are all coated. Let the meatballs finish cooking through in the sauce. Keep the pan uncovered so some of the moisture can cook off as well. Cook together for about 10 minutes. Now you can serve them or they can be kept warm on low heat for a while. 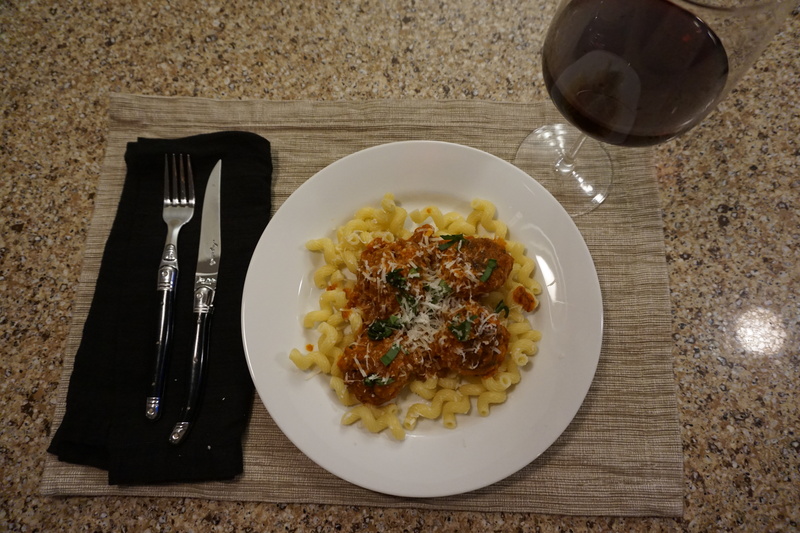 I served them with fresh basil and parmesan cheese on top alongside some pasta. Polenta would work as well or even a big salad. These meatballs can be frozen as well – I recommend freezing them in the sauce, for up to 6 months. 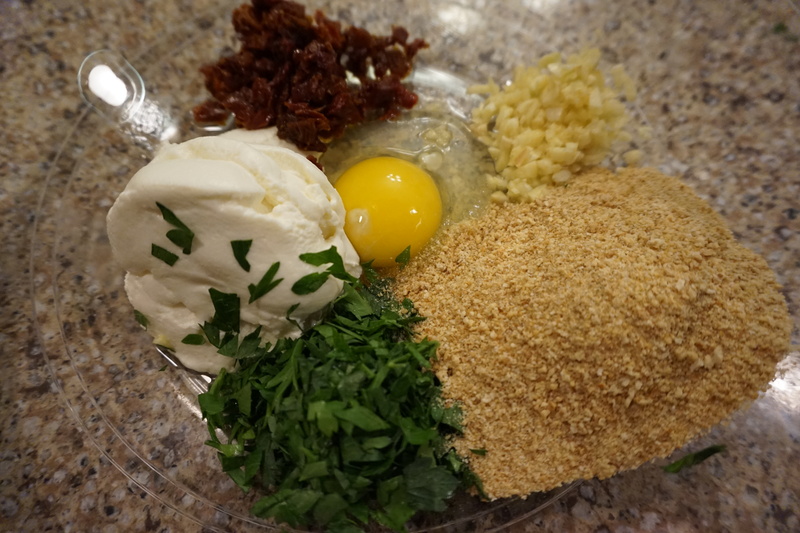 In a large bowl mix the ricotta, egg, sun dried tomatoes, parsley, bread crumbs, garlic and red pepper flakes. Mix until totally combined (with your hands is easiest) then add in the chicken and mix in just until combined. Season with salt and pepper. Line a cookie sheet with wax or parchment paper (not necessary but means less clean up). Roll the chicken mixture into golf ball size balls. Once you have all of your meatballs formed heat a large skillet over medium high heat. Add 2 tablespoons of olive oil or just enough to coat the bottom of the pan. One the oil is hot carefully add the meatballs, taking care not to splatter yourself with hot oil. Cook the meatballs for about 5 to 7 minutes, shaking the pan occasionally so the meatballs roll around and you get all the sides nice and brown. Turn the heat down a bit and add in the tomato sauce. Carefully (as to not break up the meatballs) use a spoon to stir the meatballs and sauce together to they are all coated. Let the meatballs finish cooking through in the sauce. Keep the pan uncovered so some of the moisture can cook off as well. Cook together for about 10 minutes. Now you can serve them or they can be kept warm on low heat for a while. Will have to try these because we’re always looking for ways to use cut down on cholesterol. Another tactic is to use mushrooms. I make hamburgers for grilling with 1 pound lean organic sirloin and a quarter pound shiitake mushrooms. The mushrooms are cut up finely in a food processor and mixed with the beef. For meatballs I would try plain white mushrooms.